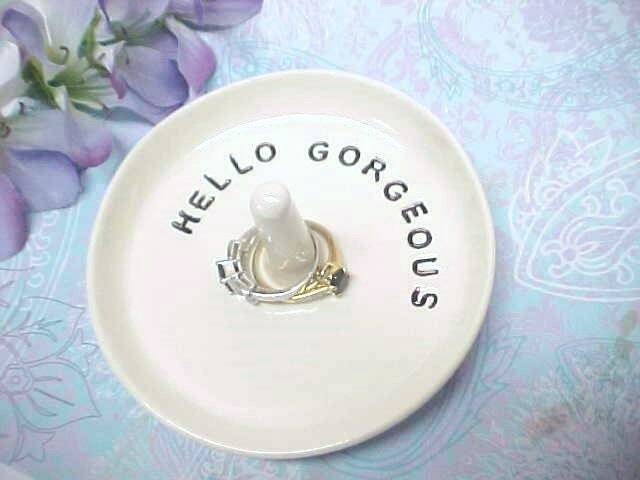 I made this lovely Ring Dish on the pottery wheel, glazed in beautiful White with Black letters which say HELLO GORGEOUS! Ready to mail for your special someone to use & enjoy! Will be a lovely reminder of your feelings & a boost to someone's ego! Dish measures approximately 3 1/2 to 4 inches wide. Glazed everywhere but the bottom, which has nice cork pads. I also make Custom Personalized Ring Dishes in this color, if you would like to see. Please contact me for your very own special one! I am making these pretty quickly for your special day, usually within 3 to 5 days!